If you're like most Americans, you're asking "Does a former mayor of TR Slyder's hometown ever blog on the Huffington Post?" For years, I refused to answer that question publicly, but after a recent series of tragedies (the Cubs lost last night, I mildly irritated my knee while running, I accidental bet a wrong exacta combinaiton for the Derby, etc.) I've re-evaluated things and decided to break my silence. Yes, at least one of them does. Paul Helmke posts a lot of articulate and difficult-to-argue-with pieces about gun control. In this instance "gun control" means limiting the number of them in the public, and not merely hitting your target. Here's a sample of Helmke's work. One warning before you read this though: This former mayor of Fort Wayne, Indiana is a white man. So don't me startled by his pic in the byline. P.S. When I was looking for a picture to post for Fort Wayne, I wasn't sure what to use, since nothing really symbolizes Fort Wayne all that well. 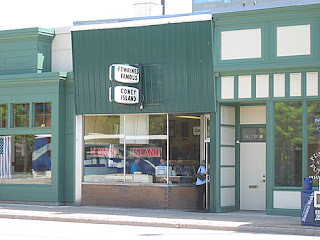 I don't think there's one image that every Fort Wayne resident would identify strongly with, so I just went with Coney Island. After Googling Fort Wayne I came upon the picture at right. It's for Fort Wayne Living magazine (you can faintly see the "Fort Wayne" atop the cover. Eagle-eyed readers may notice that is not Fort Wayne. What does that really say about Fort Wayne? "Fort Wayne- where you can read all about cooler places!" 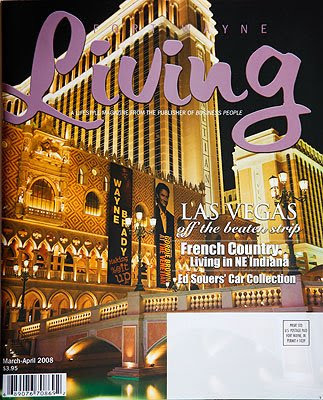 Do you think Fort Wayne was on the cover of March-April 2008's Las Vegas Living magazine? How pissed would you be if you lived in Vegas and subscribed to FWL, only to find that cover, telling you what you already knew? I'm gonna have to demand better from you, Fort Wayne Living. Wow. My hometown's single-A baseball team just changed names for no reason. They used to be the Fort Wayne Wizards. Now they are the Johnny Appleseed homaging- Tincaps. Above is their logo. No seriously, that's their logo. Way to keep it greezy, Fort Weezy. I just hope their motto is: "Hide the Women and Children: We're Coming to Your Town to Spread our Seed." My long-winded rant on their new appellation: I don't get team names like that. When you name your team after an object (or person) that exists in your city, you do so when there is a plurality of them. Take the Florida Marlins, for instance. Florida has multitude of Marlins, so it makes sense to name them the MarlinS, plural. Their team represents all of the marlins in Florida. But if your city has one of something, you can't name it that name plural. It would be stupid for Chicago to have a team called The Sears Towers, because there is only one Sears Tower- you are pluralizing something singular and it doesn't work- if anything, you're diluting the cache of the one existing Sears Tower by claiming that you're fielding an entire team of little Sears Towers. Conversely, the Florida Marlins aren't cheapening the marlin population in the wild, because there are already so many of them. Fort Wayne calling themselves the Tincaps is an homage to Johnny Appleseed who famously wore a tin put on his head during his Midwestern sojourn. No one else in Fort Wayne has ever worn tin, in any form, as a hat since him. So why pluralize something unique? But what's even dumber is that material of the Tincaps' caps is 85% acrylic, 15% wool! How the hell can you have such reverence for tin caps if you, yourself refuse to wear caps made of tin??? The White Sox wore actual white socks, and the Red Sox wore red socks back when socks were officially part of their uniforms. And the Red-winged Blackbird is an actual black bird with red wings! So what makes Fort Wayne think it's so special that they think they don't have to abide by the precedents of name/uniform truth? Cuz I'm from there, baby.